In a small enclosure to the south east of Deanery Place is the second circle we visited at Glebe. 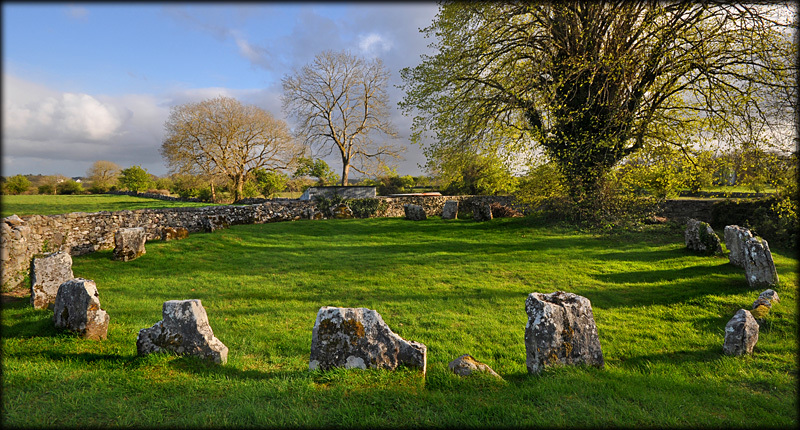 This wonderful circle is in a gorgeous setting, although the wall to the east is too close to the circle. 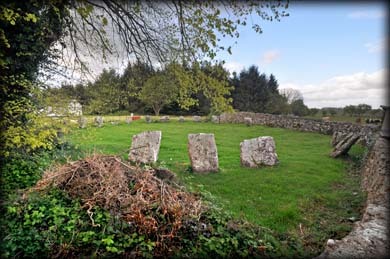 There are at least twenty stones in the circle and Burl, who gives it a top rating of 1, thinks the flat topped stones are graded towards the south-west. The tallest stone at the south is 1.2 metres high and the lowest to the north average 75 cms in height. We were extremely lucky with the light on our visit. The long shadows and gorgeous evening light created an enchanting atmosphere. Situated: Very easy. We asked at the Old Deanery for permission to visit and were told to use the track to the south of the Deanery. This brought us to this circle on our left over the wall. Discovery Map 38: M 1617 5605. Last visit April 2012.